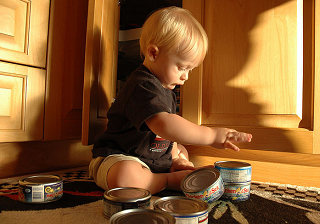 Even very young babies love putting things in cans. In and out, it amuses them for quite a while. 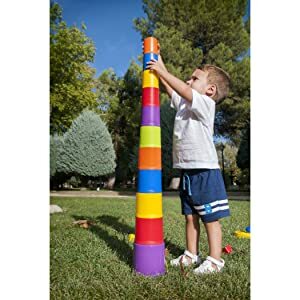 Inside your kitchen cupboard, you will find the makings of a great stacking game! A tomato paste can fit inside of a small frozen juice can, which fits inside a large juice can, which fits inside a big spaghetti sauce can, which fits inside of a 48 oz juice can. Rather than tossing them into the recycling bin, just go around the top of each can with the can opener a few times. Then carefully cover the top rim with tape - adhesive tape, duct tape, etc. so baby won't get cut. 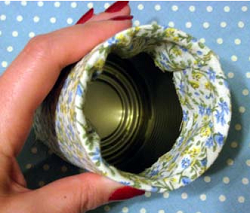 If you have some fabric laying around, wrap each can in a different type. You can use a safe glue, or hold the fabric on with rubber bands - top and bottom of the can. Try foil, burlap, nylon, mesh, corduroy, fake fur, velvet, sandpaper, leather, satin, and more! When everything is ready, offer your baby three cans to begin. After the baby has finished examining them in his or her own way, show baby how they all fit together. As your baby's interest grows, add another can to work with. Once baby gets bored with this, stack the can in a tower. Placed next to each other, they make stairs for a toy to walk up. Then drop one can on top of the other until they are all hidden inside the biggest one. Before you know it, your baby will be showing you! Thanks to Betty for this Frugal Baby Tip!